If you’re looking to add a slice of symbolism to your Seder table, then take a close look at this colorful hand-painted wooden Seder plate. It is a wonderful work of art, depicting the Jerusalem skyline at its finest. Passover is a festival full of meaning and symbolism, from matzah to bitter herbs and beyond. 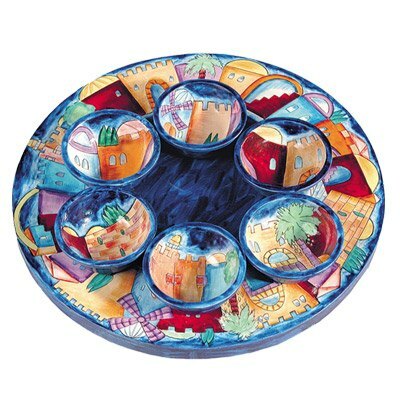 Seder night is of course the focal point of the festival and if you would like to add extra meaning to your Passover celebrations, then consider purchasing this stunning Seder tray. The plate itself is a basic, round shape made of crafted wood. It has been beautifully hand-painted to depict scenes from Jerusalem’s old city skyline. The recognizable iconic images include the ancient city walls and towers. Set against the backdrop of a dark blue sky, this Passover plate really does catch the eye, given the vivid colors that the designer has chosen to use. The outstanding design is repeated in the six individual bowls, which are used for the ingredients of the Seder table. Each one is intricately painted to include the same classic images of Jerusalem, displaying a truly high quality of craftsmanship. It will certainly be a point of pride for anyone welcoming guests on Seder night. While many Passover plates and Seder trays are designed to be functional, this item goes far beyond mere practicality. This plate will sit proudly in your home before and after Pesach too. It is in its own right a beautiful piece of art and can sit proudly in any display cabinet when not in use. It is the perfect gift for weddings or a new home. As an outstanding example of Jewish art at its best, it will also greatly enhance your Pesach celebrations.